This BioProvince (as defined by Armen Takhtajan) occupies the coastal belt and escarpment mountains south of the Namib and forms a wedge of rugged country between the Namid and Namaland bioprovinces stretching from the Richterveld northwards to the vicinity of Aus. The so-called Little Karoo lying between the Cape mountain ridges, the Langeberg, and the Swartberg ranges, is also included in this BioProvince. This southwestern corner of Africa largely consists of erosion-resistant, quartzitic sandstones. It experiences a Mediterranean type climate with dry summers and wet winters. The flora comprises many endemic members of the Aizoaceae and Crassulaceae. 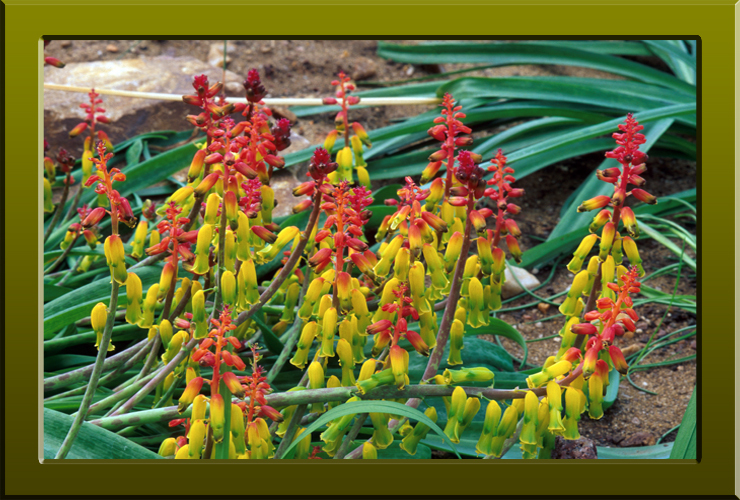 Many of the indigenous plants are succulents especially in the area known as the Succulent Karoo. These range in size from virtually subterraneous to shrubs up to 2.5 m. The Succulent Karoo occupies a belt between the strandveld and the mountains of the Namaqualand escarpment. Its botanical diversity is unparalleled by any other arid region, and is the only plant diversity hotspot that is entirely arid. Of the 5000 indigenous species nearly 40% are endemic. It also has the richest succulent flora in World with about one third of the World’s 10,000 species or so, making it the most succulent vegetation on Earth. Another unique feature is the large number of miniature succulents (ca. 435) and geophytes (ca. 630). In fact, no other region has a greater diversity and splendor of bulb species. The main succulent plant families are Aizoaceae, Aloaceae, Crassulaceae and Euphorbiaceae, while dominant among the geophyte families are Amaryllidaceae, Asphodelaceae, Hyacinthaceae and Iridaceae. Trees are uncommon but those that are present have developed some extremely strange morphologies such the endemic or near endemic quiver tree, Aloe dichotoma (Aloaceae), and the endemic halfmen, Pachypodium namaquanum (Apocynaceae). At the other extreme are the minute embedded succulents, such as the endemic Euphorbia stapelioides (Euphorbiaceae), Fenestraria rhopalophyllum and Lithops herrei (Aizoaceae). Lachenalia aloides var. quadricolor (Hyacinthaceae) commonly known as cape cowslip this plant is endemic to the Western Cape where it occurs on granite outcrops (Copyright © 2010 Peter Martin Rhind).